Today, more than 3,000 teachers in Denver went on a historic strike against neoliberal education pay proposals that make teachers pay tied to a management created bonus structure. It’s the first strike in Denver since 1994. 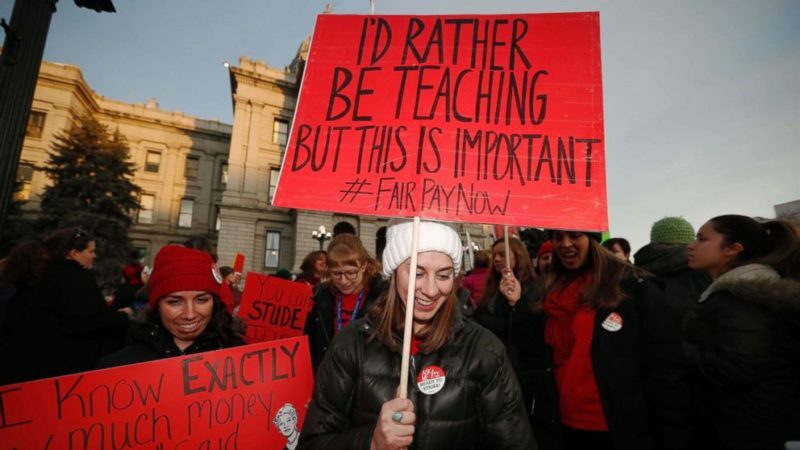 It comes 9 months after a week-long successful strike in Pueblo, Colorado last May inspired many teachers in the state to push for more. Now, the teachers have gone on strike over pay proposals that leaves teachers with unpredictable bonuses that depend on factors of testing and management-driven performance evaluations. “It’s largely dependent on variables that are outside of the teachers’ control, the educators’ control so what that means is that educators have to rely largely on variable pay that changes size over time,” says Roman. Instead, the union would like to raise base pay for all teachers and do away with the importance of the bonus system. After 15 months of bargaining, Roman says they felt left without any option, but to strike. “For the past 15 months, the district has shown disinterest at best and contempt at worse for a good faith bargaining process and right now, we don’t feel that anything is happening at the table, which is going to help our students,” says Roman. The way I look at the strike is that; its tension when you are asking for the kind of change, we are asking for, you need some level of healthy tension,” says Roman. Many of the teachers in Denver say they were inspired by last year’s week-long teachers’ strike in Pueblo. To prevent a strike, the district has fought back with scorched earth tactics including sending letters to immigrant teachers that their visas could be revoked if they are out on strike instead of working (They later apologized). Denver Classroom Teachers Association President Henry Roman says that the district also has informed pregnant women that they could lose their health insurance if teachers went on strike. “Most of our educators happen to be female, many of them are on maternity leave and the district was basically stating: ‘Hey, you are going to lose your health insurance,’” says Roman. Despite the threats, over 3,000 educators went out on strike in a show of defiance. It’s unclear how long the strike may go with some teachers saying they are prepared to go weeks. So far, the teachers have been able to maintain public support. One poll conducted by the union in mid-January showed that 82% of the public sides with the teachers’ union position over the school boards on teacher pay. Union officials report being overwhelmed by the show of support today for the union and likely during many previous strikes, support may grow for the teachers as they take to the streets. After Monday’s display of force by the teachers’ union, Roman and other labor leaders are optimistic that the school district may come back with a better offer Tuesday. “Both parties need to take some time to cool off and come back Tuesday dedicated to getting something really good for the teachers,” says Roman. With public support, Roman feels confident that his union can defeat the corporate democrat establishment which has dominated education politics in Denver for so many years. “The tide is most definitely changing,” says Roman. Be the first to comment on "3,000 Teachers in Denver Go on Strike"